Planning on hosting an experiential event this fall? If so, then you may also want to serve up some fall-friendly snacks and treats to get your attendees immersed in the spirit of autumn. Whether you decide to set up food stands throughout your event space or simply pass out treat bags to your attendees, we've got some tasty and relatively simple fall snacks to consider serving up. Apple cider and doughnuts go together perfectly, allowing you to bring the joy of a day at the apple orchard into your event space! These are super easy to make, especially if you buy the doughnut mix pre-made. And don't worry; you don't need to fry them. You can purchase a doughnut baking mold that will allow you to pop these in the oven for easy, mess-free baking. Treat your attendees to a fall flavor with an added energy boost by whipping up a batch of pumpkin energy bars. These are easier to make than you may realize, and the pumpkin flavor comes from adding some canned pumpkin puree. Honestly, these taste a lot like pumpkin bread, but have added nutritional benefits and will provide the energy your attendees need to power through the day. Shy of setting up an actual s'mores station at your event (which we totally recommend, if you can pull it off), these s'mores cookie bars are probably the next best thing. You can make these pretty easily by starting with your "typical" chocolate chip cookie dough (buy some pre-made from the store, if you prefer) and adding chunks of Hershey bars and marshmallow. Spinkle in a little cinnamon and chunks of graham crackers before baking, and cut into small bars once cooled. Marshmallow pops make for yet another delicious and fall-friendly snack, and they're especially fun if you're going to have any children at your event. These are pretty simple to make. Simply begin with large marshmallows (like the kind you'd use for roasting) and dip them in melted chocolate before rolling them in sprinkles. You can use a toothpick or small skewer to hold them. Pop them in the fridge for about an hour, which will give the chocolate time to harden. Then, enjoy! If you want to get really festive, you can even melt white chocolate and add food coloring (we're thinking fall colors, like reds and oranges) to really pull of that autumn theme. Who doesn't love a bag of trail mix as an energizing and filling snack? Incorporate fall flavors into your trail mix by starting with a store-bought bag of traditional trail mix. Then, add some butterscotch chips, chocolate chips, and pretzels. Season with a bit of salt, cinnamon, and brown sugar. Mix well and enjoy! You can serve these up in small bags to make them easy for your event attendees to grab and take with them. If you want to incorporate a little Halloween spirit (depending on when you're holding your event), you might consider adding some Halloween candy. Maybe stay clear of the candy corn, though. These are just a few ideas for snacks and treats you can easily prepare to bring some lovely fall flavors into your next experiential event. Your attendees will love these snacks, but don't be surprised if you get people stopping you to ask for the recipes. And of course, if you're still on the hunt for a great space to host your next event in the Miami area, be sure to check out Soho Studios! If you love a great adult beverage and a yummy dessert, you will definitely be excited about the new trends and sweet treats marketers of experiential events are dishing up that include both! Lucky attendees are swooning over the new boozy event fare that tempts them to taste this magical fusion of their favorite desserts and cocktails. While alcohol-infused desserts have been around for a while in classic desserts such as decadent Tiramisu and the ever-popular Bananas Foster, some new creations have been seen in trendy restaurants over the past couple of years in the form of cakes, puddings, ice cream and more. This fun combination is so popular, it is now making its way to experiential marketing events and attendees are eating it up! If you are looking for an amazing way to get attention for your next 21 and up experiential marketing event, check out these new ideas centered around fun and trending boozy desserts that are stealing the show and creating quite a buzz (Pun intended!) at recent experiential marketing events. What a fun and unique way to get the party started and get the attention of some new customers in the process. Liquor Infused Ice Cream - Everybody loves ice cream and this new alcohol infused ice cream has event- goers eating it faster than it can melt. There are a variety of new companies specializing in these spiked ice creams that offer it in many delicious flavors from Vanilla Bourbon and Coconut Rum to Irish Cream and Vodka Key Lime Pie. Drunken Cupcakes - Cupcakes have always been a staple for any kind of party or event. Alcohol infused cupcakes kick this favorite treat up a notch and get the immediate attention of attendees. Popular concoctions include Chocolate Hennessy, Margarita, Pina Colada, Lemon Drop, White Russian, and more! Wine Infused Fudge - Recent culinary trends show that nothing goes better together than wine and chocolate. Many wineries have started to merge the two amazing flavors into an extraordinary treat. Fudge infused wine is growing in popularity. In fact, Alto Vineyards in Illinois indicates that their port wine infused fudge is one of their top sellers. Boozy Milkshakes – The perfect combination of sweet and spiked, adult milkshakes are a huge hit at experiential events. The long-time favorite treat is a great way to create a buzz around a product or as a unique catering detail to wow crowds. Spiked Cakes and Pies – Get the attention at your next event with a vodka infused cake or a whiskey laden pie that is sure to please. From golden rum cake to chocolate bourbon pecan pie to Irish coffee cheesecake, spiked cakes and pies speak to everyone! There is simply nothing like taking your favorite cocktail and making it into a delicious cake or pie to star in your event. WineSicles – Sure to be a crowd pleaser, frozen wine popsicle treats, known in the food world as ‘WineSicles’ are very popular, especially with wine connoisseurs who are always looking for something new. These make a great marketing tool and will definitely get folks taking about your event. As one would expect, the team at Patrón knows exactly how to throw an alcohol infused attention getting event. Recent marketing efforts include experiential events that add a little sweetness to their premium tequila by using it in a variety of delicious and intoxicating dessert offerings. The Patrón team recently presented the crowds with incredible Patrón Tequila infused truffles and Mocha Patrón XO Café Macaroons. The folks at Patrón are taking this new tend to heart and have even teamed up with a chocolatier to invent creative new ways to combine their tequila with dessert options. They also offered Silver Patrón infused popsicles and new “Muddle Your Mojito” bars where attendees choose their favorite fruit and muddle (smash) them while a bartender helps them mix the fruit and liquor to create their own personal sweet and fruity concoction. As a take-away, guests were given the muddler, which they could have custom engraved to their liking. Today, leading providers are dishing out free samples, packing on unique tastes and creating delectable dishes guaranteed to please. Every area has foods and other items that are unique to it. For example, Florida is known for its citrus fruits and beaches. A citrus-based display with beach imagery will be a sure hit for an area-specific snack bar. There's no need to exclude all other food options, either. Just be sure to have some orange things prominently present to get the effect. While Florida may be known for oranges, the city of Miami is known for its people. As a Florida city, it is a mix of both domestic and overseas immigrants. Southerners, Northerners, Cubans, Mexicans, and Puerto Ricans all share the space and eat each other's foods on a regular basis. Simply serve some of each of these cultural foods for a great all-around "taste of Miami" effect. You can also aim for whichever foods your audience will find exotic in order to present a daring atmosphere of trying new things. If your event caters to an upscale crowd, you'll definitely make the right impression by having a professional chef make up the offerings. Even so, resist the urge to go for full-course meals or large desserts. Remember that this will be for a relatively short break instead of the dinner hour, and specify foods that can be picked up and carried by people who'll want to walk around and network as they enjoy the food. Desserts are always a hit, and what better way to say "Florida" than at least one Key lime pie stand? Drinks also tend to be regional. Here, you'd be remiss to forget sweet tea – the quintessential Southern staple. Of course, Florida orange juice is obligatory as well. Don't forget to offer coffee, too. It may not be regional, but it is still one of the most popular non-alcoholic drinks on Earth and is very compelling for its fans. These are just some of the ways you can set up food stands to make your event memorable even during the breaks. The other thing you need is a good venue. Check out Soho Studios in Miami for the perfect place to present your next Florida-based meeting, event, or expo. Messy foods are for outback grill events, booze cruises and music festivals, right? Wrong. Event guests appreciate easy-to-eat options, and catering groups are repurposing age-old recipes to make event options more appetizing. Preston Bailey turned an entire Four Seasons New York Downtown into a catering establishment, supplying tiramisu as a grab-and-go options. Striking out the eating difficulty, it successfully celebrated its partnership with Four Seasons, all while keeping event-goers happy. Yes, it’s possible to eat a S’mores product without the mess. In fact, S’mores created campfire lollipops to familiarize their guests with handheld fun at the Engage!14 Wedding Summit. By reinventing an age-old theme in a new way, S’mores effectively redesigned the way guests look at desert. By dishing out fried chicken stored in waffle cones, Great Performances allowed its guests to roam about the premises with self-serve options designed to circumnavigate the need for plates. Fried chicken might not be the hardest-to-handle food item, but it’s certainly deserving of a little ease-of-eating. The cones were offered at the Watermill Center in 2015, redefining the way chicken, itself, is dished out to hungry patrons. 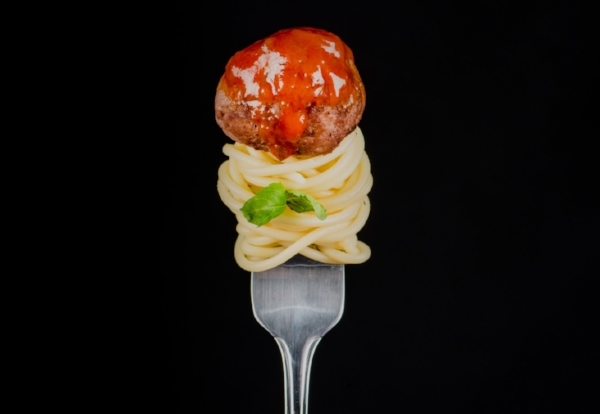 By compacting spaghetti and placing singular meatballs on top, New York’s Elegant Affairs created a clean, to-the-point version of traditional spaghetti dinners. The mess-free food item gave patrons a micro approach to an age-old macro problem associated with messy spaghetti event dinners. That’s right: salad bites. Alongside spaghetti, salad is a notoriously difficult event dish to serve cleanly. By creating salad bites hors d’oeuvre, Occasions Caterers gave patrons fork-served eating options capable of tidying up the dish’s regular problems. Hummus is messy. Really messy. The Washington Humane society, however, offered a selection of hors d’oeuvres hummus and pita bites, celebrating their 2014 Fashion for Paws runway event. Sometimes, alternative food options work well. They certainly revamp many age-old ideologies surrounding proper event food options. Check out more annual food options, and stay sharp with this year’s best event creations. If you're going to be serving food at your event, it's important to choose menu items that everyone can and will eat. This will be hard if you try to make a different menu for all of the many common dietary variations. Instead, try combining gluten-free and vegan to create dishes that almost everyone will love. One of the most important things you'll need to keep in mind is the difference between vegetarian and vegan. Vegetarian dishes may include eggs, milk, and other products that ultimately come from animals. Vegan food, on the other hand, includes none of that. Only plants and plant products are allowed. The key to wowing a mixed-preference audience with vegan dishes is to avoid the bland, diet-type fare non-vegans often associate with this type of food. Instead, make sure the meals are tasty. Hire caterers that use spices and sauces liberally to pump up the flavor volume and add delicious-looking color to the dishes. Also, make sure that your catering company is used to cooking for vegans. Such companies will have plenty of delicious recipes already developed. When you're providing lunch, meat-eaters likely won't be too put out if they don't get any meat in the meal. The same cannot be said of dinner. Unless your company gets marketing points from going all-vegan, offer a meat-included menu for this meal along with the vegan one. Note, however, that some vegans insist that their food be cooked in different areas than those used to cook meat! Fortunately, there are some caterers out there that will actually cater to even this demand. The days when you could just serve a mystery sauce or meal are over. For reasons that are not quite understood, the incidence of life-threatening food allergies is higher than it was just 30 or 40 years ago. Therefore, you should always list potential food allergens. It's also important to know for certain exactly what is in everything, vegan or not. This isn't to say that it's dangerous to serve meals. You simply need to know what is in all of the food so you and your staff can give accurate answers to those who ask about the ingredients. With these things in mind, you'll be able to serve anything from a snack to a feast and have it be both safe and impressive. The final thing you'll need is a venue. If your event is in Miami, try our event and exhibition area here at Soho Studios. We offer up to 70,000 square feet that can be configured to meet all of your event needs. Catering is the professional preparation and serving of food and beverages. Event planners find it a convenient method of advancing their guest’s hospitality needs. The business is booming – and why not – the hospitality industry has upped its game. But what does event catering entail? What are the expected industry minimum standards? Well, like all businesses, it requires professionalism and meticulous planning. Without a good team, event catering will be a bad experience for the person organizing it. A great example of an event where you can find a wide variety of catering for events in Miami is The South Beach Wine and Food Festival. The Wine and Food Festival is four day culinary extravaganza that features wine and cuisine from all over the planet. Below are the various stages of an event catering process. To be successful at event catering, caterers need to be adept at food preparation and cooking. To be a professional cook or chef, you need to have under gone at least 3 years training in a food and hospitality college. Hygiene when cooking food cannot be gainsaid. The most successful event catering business is the one that observes personal hygiene almost to the level of eccentricity. You need to have the necessary cooking utensils such as cooking pots, cooking pans, cooking sticks etc. Good cooking is one thing, delivering the food in a hygienic and professional manner is another. Food delivery is a nightmare if you do not have the right equipment. You need to have automobiles that are sanitized, good packaging utensils and crockery, and refrigerated vans for perishable vegetables and drinks. You need to be able to deliver the food in time, serve in time and clear out the event venue in time. Event catering is a time conscious business. Event catering should be an organized affair. You will need to have the kitchen staff, the transportation staff, the waiting staff, managers, suppliers of food materials to the kitchen, event decorators as well as cleaning staff. As an owner of an event catering business, you will be expected to handle this staffing logistics with ease. Before taking up an event catering job, this entire staff must be in place. Failure to have the necessary staff is planning to fail. Most companies that outsource event catering services expect the catering firm to decorate and arrange the venue as well as serve the guests. From event themes and colors to table arrangement and fixing a temporary bar and kitchen, a manager at a catering firm is expected to have the event venue ready. Note that event catering is not a business for the faint hearted or the disorganized. It is a business for people with excellent planning capabilities. To handle the large number of people and logistics, you need to have management skills and high emotional quotient. You will need to be able to balance competing egos with your business agenda. From arrival times of the various event guests to meal times and beverages servings, a caterer will have his hands full. Always remember to ask what kind of guests will be attending the event. You do not want to be caught off guard by having guests that are vegetarians, teetotalers, or those that are restricted by their religions from taking certain foods. Event catering is a highly complex and demanding business, yet being involved in it is both exhilarating and involving. If you are into event planning you most likely have some event planning tools you are comfortable with. There’s software, social marketing, even multiple event planning apps. There is one event planning tool that more marketers and event planners are utilizing. It is experiential marketing. Experiential marketing uses one basic psychological fact…we learn from our experiences. It ties this fact in with a product or brand to help people feel a certain way about that brand. One such experiential marketing event took place recently at an event space in Miami called Soho Studios. Soho Studios is no stranger to events in Miami. They have been a venue used by art shows, concerts, fashion shows, meetings, and parties. It has been used as a commercial shoot location, photography studio, and a film studio. It has been utilized by such companies as Ford Motor, Evian, Telemundo, and Puma. This experiential event featured Absolut Vodka X and 2,500 excited Miamians. It was the Absolut X Bloc Party, and when the doors opened guests were asked to wear a mask or have their faces painted for a masquerade party. As guests entered they were greeted by a giant archway with a DJ atop, and a bar on each side of the archway. Drinks at the bars included Absolut Greyhounds (Absolut & Grapefruit Juice), Absolut Caipiroskas (Absolut, lime and sugar), and Absolut punch. Absolut also commissioned Miami artist Agustina Woodgate to create artworks that would later be auctioned for charity. No doubt the highlight was the show put on by British indie-rock band Bloc Party, playing for the very first time in Miami. It was an Absolut blast and you know the crowd left with a great feeling about the premium vodka brand. Do you have a brand that could benefit from experiential marketing? Consider a venue in Miami that South Florida is turning to more and more for the hottest events, Soho Studios. With 65,000 square feet of multipurpose space, the venue is perfect for a variety of experiential events. Contact the experienced staff at Soho Studios who will assist you in creating your incredible event. People love attending great events but often, once they are there, think little about all the hard work that has gone into preparing the site and elements for the big night. However, planning your event requires a wealth of organization skills to promote a successful date. On the competitive scene of South Florida, just acquiring a venue in Miami that meets all your needs takes a true commitment to parsing the value of each one that is available. Having a good team around you will only go so far if you do not have things in order for yourself. Using event planning tools is vital in today’s connected world of social media and mobile technology. People look to their smart phone for updates regarding the topics that interest them and these numbers are only going to rise. As time goes by more technology is becoming integrated to this "internet of things" such as our cars, watches and TV. Soon many of us will be walking around with a collection of tools that enable us to perform tasks that otherwise would have taken a desktop computer. In some cases there is no prior equivalent product on the market. Google Glass is a new offering from the tech giant that has been getting a mountain of press over the last 6 months. The question is, how can it help manage your date at an event space in Miami? Well, first this is a wearable technology too! They are essentially Internet capable glasses. So, as opposed to hawking your cell phone all the time, interrupting conversations or becoming totally distracted by a new email message, we can have a constant flow of data that is directly in view at all times. While some people might imagine this to be the next step towards Borg singularity it just might be the tool you have always wanted as an event planner or event promoter. If you are in the event planning industry and are not yet using Pinterest, you are missing out on a powerful tool. Pinterest is a valuable resource in helping get your word out on conferences, film festivals, music festivals and other events you may be planning. It is also great resource to exchange ideas. Pinterest works as a digital pinboard, or bulletin board, that allows you to post photos and ideas and ask for suggestions. It not only can help in marketing your event online, it also adds more fun and creativity into your event planning. In addition it is a great way to share photos of all your events and build excitement for future events! With Pinterest, you can direct visitors to your blog, drive users to your website or other social media channels and engage them further. It is a visual social media tool that is based in creativity, but by its very nature allows for some subtle, and perhaps not so subtle, online marketing. Pinterest allows you the ability to showcase hotels, the venue, vendors, speakers and entertainment that may be a part of your event. Like all social media it is about sharing, and sharing is good when it comes to getting the word out about your event. Don’t forget the networking aspects of Pinterest. You can widen your contacts of like-minded individuals and share contacts and concepts. It is sort of a LinkedIn for creative people. If you are searching for a superb location for your next event and are considering venues in Miami, contact us at Soho Studios. With a word-class client list that includes Evian, Ford Motor, Absolut, and Puma, we have the experience to assist you in all aspects of your South Florida event. Soho Studios is over 65,000 square feet of event space Miami utilizes for photography, video, conventions, meetings, conferences, art shows and even some of Miami’s famous parties. Contact us today and let us help you take your ideas from concept to completion. We are Soho Studios, Miami’s premier venue located in the trendy Wynwood District, home of Art Basel Wynwood.